"Aunt Nauseam" was the tenth episode of the fifth season of Daria (episode number 510). It first aired on MTV on June 4, 2001. This episode is frequently misspelled as "Aunt Nauseum." "Aunt Nauseam" was written by Jacquelyn Reingold. Just as Helen arrives home and announces that she's got some time off -- she and Eric Schrecter had just finished a big court case, and Eric is taking a month off -- her sister Rita calls and asks her to handle her daughter Erin's divorce. Helen tries to beg off, saying that divorce cases aren't her strong suit, but she finally accepts after being pressured into it by her mother. 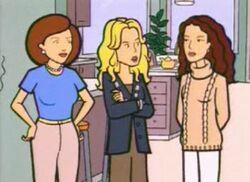 As relationships all around continue to crumble, Daria finally calls in the cavalry: Aunt Amy. When Amy arrives, Daria catches her up on the situation, and Amy in turn helps Daria realize that Tom wasn't trying to interfere; rather, Tom was trying to be supportive. Amy then wades into the middle of Helen and Rita's battle... and gets caught up in it herself. Fed up with the whole situation, Daria and Quinn start imitating their mom and aunts arguing with each other, which finally shows them just how silly they were acting, and they make up with a group hug (for which Amy blames Daria, of course). The same-dress situation between Stacy and Tiffany is also resolved, in a weird way: Stacy accidentally ruins Tiffany's dress by spilling grape juice on it, and offers to give Tiffany hers to show how sorry she is; Tiffany, overcome with emotion, hugs her friend, which in turn gets grape juice on Stacy's dress. Other situations are resolved as well: Daria and Quinn watch Gone With the Wind together and promise to never become like their mom and aunts, Daria apologizes to Tom for brushing him off all week, and Brian and Erin reconcile in Switzerland. Several alternate universe series, like John Lane and Finn Morgendorffer, and individual fics like TAG's "After the End" have included events similar to "Aunt Nauseum" in them. Daria mentions sarcastically that Amy came to "save the day" and showed herself to be no better than her sisters. Yet "I Don't" and "Through a Lens Darkly" gave no indication that the writers viewed Amy as a deux ex machina. However, many fanfics did, such as C.E. Forman's "Quinntet" (Kara Wild's "None in the Family" was one of the few exceptions). The show's writers might have learned indirectly of Amy's popularity and challenged it in the show itself. Fics like For Better or For Worse, For Richer or For Poorer by Kristen Bealer and Mr. and Mrs. Danielson by ticknart detail what Erin & Brian were going through in the background of the episode. This page was last edited on 1 April 2013, at 00:30.